The microstructures of iron and steels is complicated and diverse which is influenced by composition, homogeneity, heat treatment, processing and section size. Microstructure of castings looks different than those of the wrought products even if the composition is same and even if the same heat treatment is given. Pure iron is polymorphic. Two allotropic phases exist for pure iron in solid state depending on the temperature. One is bcc (body centered cubic) and the other is fcc (face centered cubic). The bcc crystalline form (?-iron) is stable until a temperature of 912 deg C when it is transformed to fcc (?-iron). The ?-iron remains stable until 1394 deg C, and then it reverts to bcc structure (?-iron). ?-iron is stable until the melting point of 1538 deg C. High purity iron is very weak. The ability of iron to accommodate heavy interstitials, namely carbon and nitrogen, is mostly responsible for the strength and the hardening effects. ?- iron refers only to the bcc form of pure iron that is stable below 912 deg C. Ferrite is a solid solution of one or more elements in bcc iron. The carbon solubility of ferrite depends on the temperature: the maximum being 0.02 % at 723 deg C. Ferrite may precipitate from austenite in acicular form with certain cooling conditions. Ferrite is a very soft, ductile phase, although it loses its toughness below some critical temperature. ?-ferrite is magnetic below 768 deg C.
? – iron refers to fcc form of pure iron that is stable between 912 deg C and 1394 deg C. Austenite is a solid solution of one or more elements in fcc iron. Austenite is stable above 723 deg C depending upon C content. It can dissolve upto 2 % C. Austenite is not stable at room temperature in case of ordinary steels. However in case of Cr- Ni steels also known as austenitic stainless steels, austenite is stable at room temperature. There are other austenitic steels also such as Hadfield manganese steel and iron nickel magnetic grades. For heat treatment of steels, austenite is the parent phase for all transformation products that make steels so versatile and useful commercially. Austenite is a soft, ductile phase that can be work hardened to high strength levels. Austenite is non magnetic. For case hardened carburized steels and high carbon high alloy steels (e.g. tool steels), use of an excessively high austenitizing temperature dissolves excessive amount of carbide, which suppresses the temperatures where martensite begins and completes its transformation to such an extent that austenite is present at room temperature. This austenite is called retained austenite but it may not be necessarily stable. Excessive retained austenite in tool steels is usually detrimental to die life since it may transform to fresh martensite and cause cracking or reduce wear resistance. Retained austenite in a carburized gear tooth is beneficial since teeth are not shock loaded. When steels are heated during hot working, they are in austenitic condition. Subsequent cooling of hot steel results in the transformation of austenite to other phases or constituents. Air cooling (normalizing) of hot austenitized steel results into diffusion controlled transformation of austenite where ferrite precipitates first, followed by pearlite. ?-iron is the bcc form of pure iron that is stable above 1394 deg C to the melting point of 1538 deg C. Delta ferrite is the stable high temperature solid solution of one or more elements in bcc iron. Delta ferrite may be observed in as cast austenitic stainless steels, in some precipitation hardened stainless steels, in some martensitic stainless steels and in some tool steels. Delta ferrite is usually considered detrimental to transverse toughness when it is present in a hardened structure. Delta ferrite is not always detrimental. When austenitic stainless steels are welded, the weld metal’s composition is adjusted to produce a certain level of delta ferrite in the as cast structure to minimize the risk of hot cracking. The delta ferrite forms in the last regions to solidify and has an interconnected dendritic appearance. One of the form in which carbon exist in the iron is graphite. It is stable form of carbon in iron usually observed in cast irons. Graphite in cast iron can take several forms, such as flakes of different sizes and distributions in gray cast iron and nodules in ductile cast iron. There are other shapes also such as temper nodules in malleable cast iron and short stubby flakes in compacted cast iron. Graphite is observed sometimes in steels also where it is either deliberately created as in graphitic tool steels or accidentally created by long term, high temperature exposure. Cementite is an intermetallic metastable compound of iron and carbon (iron carbide) with approximate formula Fe3C and an orthorhombic crystal structure. This compound contains 6.67 % of carbon by weight. Some substitution of other carbide forming elements such as Mn or Cr is possible. But only small amounts of the various carbide forming elements can be substituted before alloy carbides of other crystal structures and formulae are formed. Cementite decomposes (very slowly, within several years) into ?- ferrite and C (graphite) at 650-700 deg C.
Cementite is hard but brittle and can strengthen steels. Its hardness is 800 HV for pure Fe3C and upto around 1400 HV for highly alloyed carbide. Mechanical properties of steel depends on the microstructure, that is, how ferrite and cementite are mixed. Pearlite is a fine mixture of ferrite and cementite arranged in lamellar form. It is stable at all temperatures below 723 deg C. Pearlite is formed due to eutectoid reaction. The eutectoid transformation is an isothermal, reversible reaction in which austenite is converted into two intimately fixed solid phases namely ferrite and cementite. With time and temperature, the cementite in the pearlite gets spheroidized which means that it changes from a lamellar to a spheroidal shape. Due to the spheroidizing action of cementite, the strength and hardness of the steel is reduced and its ductility increases. The degree of change is a function of the carbon content of the steel. Pearlite increases the strength of carbon steels. Mechanically, pearlite has properties intermediate to soft, ductile ferrite and hard, brittle cementite. Refining of the interlamellar spacing also increases the strength and the toughness. The hardness of fully pearlitic eutectoidal steel varies with the interlamellar spacing from about 250 HV to 400 HV as the spacing decreases. A different two phase constituent called bainite is formed if the cooling rate from austenitizing temperatures is faster than cooling in air, or if alloying elements are added to the steel to increase hardenability. Bainite is a metastable aggregate of ferrite and cementite that forms from austenite at temperatures below where martensite starts to form. The appearance of bainite changes with the transformation temperature. At high transformation temperatures the appearance of bainite is ‘feathery’. This bainite is also called upper bainite. At low transformation temperatures the appearance of bainite is ‘acicular’. This bainite is also called lower bainite. The feathery appearance of upper bainite is also influenced by carbon content and is most appropriate for grades with high carbon contents. 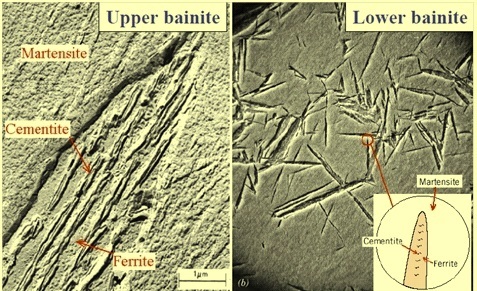 Fig 1 shows microstructures of upper bainite and lower bainite. Martensite is formed if the cooling rate from the austenitizing temperature is rapid enough (a function of section size, hardenability and quench medium). Martensite is a generic term for the body centered tetragonal (bct) phase which is formed by the diffusionless transformation. The parent and product phases has the same composition and a specific crystallographic relationship. Martensite is formed in steel because the solute atoms of carbon occupy the interstitial sites of iron atoms. This produces substantial hardenability and a highly stained brittle condition. In carbon containing steels the appearance of the martensite changes with carbon in the interstitial sites. Low carbon steel produce ‘lath’ martensites while high carbon steels produce ‘plate martensite, often called ‘acicular’ martensite, when all the carbon is dissolved into the austenite. The strength and hardness of martensite varies linearly with carbon in austenite upto about 0.5 % C. As the carbon in the austenite increases beyond 0.5 %, this curve starts to flatten and then goes downward due to the inability to convert the austenite fully to martensite (retained austenite becomes increasingly present). Hence when high carbon steels are heat treated, the austenitizing temperature is selected to dissolve no more than about 0.6 % C into the austenite.